The centre-piece of the first London Piano Festival at Kings Place, on Saturday 8 October 2016, was the Two-Piano Gala, a stupendous evening of music for two pianos played by a fine relay of pianists, with the artistic directors of the festival Charles Owen and Katya Apekisheva joined by Ronan O'Hora, Martin Roscoe, Stephen Kovacevich, Kathryn Stott and Ashley Wass. The programme gave us a survey of music for two pianos from the first half of the 20th century ranging from the high seriousness of Busoni's Fantasia Contrappuntistica, through the seductive textures of Debussy's Lindaraja and Prelude a l'apres-midi d'un faun, the sheer beauty of Rachmaninov's relatively unknown Suite No. 1, and the intoxication of Ravel's La Valse, to the sparkling rhythms of Milhaud's Le boeuf sur le toit, and tangos by Astor Piazzolla re-invented for two pianos, culminating in the serious fun of Percy Grainger's Fantasy on Gershwin's Porgy and Bess. There was also a world premiere, Nico Muhly's Fast Patterns which had been commissioned by the festival. It was a long evening, three and a half hours including two intervals, but the quality of the pianism and inventiveness of the programming ensured that interest never flagged, quite the opposite. The pianists played in a kind of relay, almost with each work being given by a different combination of pianists. What came over, from the very beginning of the evening, was the sense of sheer joy and engagement as the solo pianists (very much a solitary species) enjoyed and evening of communal music making. Ferrucio Busoni wrote his Fantasia Contrappuntistica in 1910 for solo piano as a re-working of Bach's unfinished final fugue from The Art of Fugue, Ronan O'Hora and Martin Roscoe played the composer's 1921 version for two pianos, which allows for greater clarity in the contrapuntal texture, but also allows Busoni to enrichen the general harmonic atmosphere. The work is almost pure Busoni, it starts with a long prelude based on his Third Elegy and when Bach's music does appear it is surrounded by an aura in which Busoni seems to be aiming at transcendence. Though the work includes a dazzling quadruple fugue as a completion of what Bach left unfinished, the overall atmosphere is not rigour but a kind of transcendent impressionism. The opening was full of a magical shimmer, as the two pianists wove the complex textures; even expanded for two pianos, the work is still fearsome to play. (The festival had the advantage of using a pair of matching Steinways which live at Kings Place). The Bach and Bach-inspired passages includes lots of octave doubling, pedalling and lyrical phrasing which placed the work firmly in the early 20th century. The two pianists had a good grasp of Busoni's architecture, and for all the seduction of the textures, we were drawn by a greater feel for the structure to the terrific climax. One little niggle, there appeared to have been a glitch in the sub-editing of the programme notes, which made it less than clear that the work was based on Bach's unfinished fugue. Next, after a bit of re-setting of the staging, came Stephen Kovacevich and Charles Owen in Debussy's Lindaraja and Prelude a l'apres-midi d'un faune. One of the lesser fascinations of the evening was the different ways the pianists approached the piano, with Kovecevich sitting remarkably low. Lindaraja was written in 1901, but not heard until 1926. The name comes from a patio at the Alhambra (Debussy had never been to Spain), and the work may have been inspired by Ravel's two-piano suite Sites auriculaires. There was a surprisingly crispness to the rhythms in the work, but surrounded by an atmospheric texture which evoked the exotic, eventually leading to habanera-like rhythms, supported by impressionistic harmony. The development of a unison rhythm in the texture gave the whole a rather hypnotic feel. The Prelude a l'apres-midi d'un faune was far better known, and Debussy's own two-piano arrangement dated from 1895. Here it was remarkable how much of a sense of colour the pianists brought to the piece, allied to a lovely fluidity.. 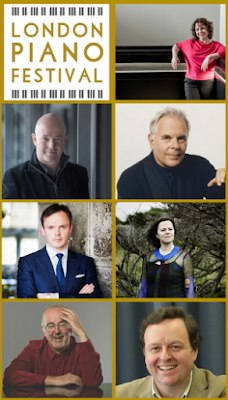 The first interval gave us a chance to spot people in the audience, and it was notable that a number of distinguished pianists had come along to support and listen, amongst them Stephen Hough, Imogen Cooper and Alexandra Dariescu. After the interval we had Charles Owen and Katya Apekisheva playing Rachmaninov's Suite No. 1. Charles and Katya are regular duo partners (I interviewed them to talk about the festival), and this really told in the rapport, pianism and sympathy which they brought to the complex yet filigree textures of Rachmannov's suite. Each movement was a pictorial tableau, but there was a sense of a story. The first movement a gondola, perhaps slightly sinister, clearly leading to the ferment of anticipation in the second movement as lovers prepare to meet, culminating in joyous abandon. But this does not last as the next movement is Tears, rain on an autumn night, which ends in a funeral march leading to the sound of bells in the final movement. In each of the movements, Rachmaninov glories in the creation of filigree textures, each of the first three has a different complex pattern of texture woven around the material. The pianists were highly responsive to these pictorial atmospherics, which culminated in the terrific Boris Godonov-like climax of the bells in the final movement. For me, this piece was one of the highlights, and one of the major discoveries of the evening. Afterwards Ronan O'Hora and Ashley Wass gave us Ravel's La Valse, written originally for solo piano, it was this version for two pianos which was played to Diaghilev in 1920 when he refused to create a ballet from it, saying 'it's not a ballet. It's a portrait of a ballet'. The opening was perhaps not as veiled as in an orchestral performance, but the two pianists brought out the sinister undertones to the music with a rich darkness of timbres. The highly atmospheric rhythms of the work ensured that there was a rather riveting dynamism to the performance which let to the positively orgasmic climax. I don't know about O'Hora and Wass, but you felt that you needed a good lie down afterwards. After the second interval, Charles Owen and Katya Apekisheva returned to give the premiere of Nico Muhly's Fast Patterns. This was a fascinating work. Rather toccata like, Muhly described it as rather like a fast tennis match but what struck me was the delicacy of texture which was rather French in style yet shot through with violence as well. Katya Apekisheva and Ashley Wass then played Milhaud's Le boeuf sur le toit, his own piano duo version of his 1920 ballet. The pianists brought a great swing to the rhythm, yet with moments of real delicacy. What came over in the two piano version was the sense of poly-tonality. I have to confess that despite the sheer verve of the performance and patent enjoyment of the pianists, shorn of Milhaud's colourful orchestration, the material did feel a little over-stretched for the length of the piece. Afterwards Ashley Wass and Kathryn Stott played three arrangements of Astor Piazzolla's tangos, made by Kyoko Yamamoto. We heard Adios Nonino, Milonga del Angel and Michelangelo 70, in performances which brought out the combination of passion, lyricism and rhythmic fascinating in Piazzolla's work. Though atmospheric and effective, I am not quite sure whether the two-piano transcriptions really suited the music, and something of the seductive, smoky edge was lost. Finally we had Percy Grainger's Fantasy on Gershwin's Porgy and Bess. This dates from 1951, when the composer was nearly 70 but there was clearly no dropping off of his pianistic invention as he crafted an operatic fantasy in piano terms. The title is, I presume, the publisher's as Grainger never used terms like 'Fantasy', his operatic fantasy on Strauss's Der Rosenkavalier is called the Ramble on Love. The work is no five-minute jeux d'esprit, but a substantial twenty-minutes. Kathryn Stott and Martin Roscoe ensured that we were dazzled and delighted, but kept a firm hand on the work's structure so that we were led ever forward. I have long been familiar with the piece, but have not heard it live for a long time and it was sheer delight to rediscover the gorgeous textures played with such love and affection. It was a shame the festival could not have found a way of rounding things off with all seven pianists, a challenge that Grainger would have relished. I rather fantasised about an arrangement of his Bridge on the River Kwai Marches which was originally written for three pianists at one piano. But overall the evening gave us a spectacular array of pianism, in which the players sheer enthusiasm, engagement and enjoyment combined with technical ability to create something really special. I look forward to next year's festival, 6-8 October 2017, when we are promised all things Russian.